The Office of Emergency Management (OEM) prepares the City to manage complex incidents, emergencies and disasters while ensuring continuity of services under the direction of the Emergency Management Program Committee. The City of Mississauga is one of the only municipalities across Ontario to employ both an all-hazards and risk-based approach to emergency management. We identify key personnel, infrastructure and critical services, develop training and exercises, and assess potential hazards to the city. Our goal is to make our city resilient by coordinating efforts to prevent, mitigate, prepare, respond to and recover from an incident while maintaining essential city services and ultimately minimizing the impact of potential risks on our community. 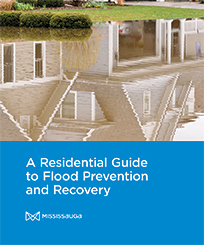 This guide outlines steps that you and your family can take right now to best ensure that you are prepared for flood emergency events in your community. View and Download.